According to the New York Times' list of top new food, a Climatarian is "A diet whose primary goal is to reverse climate change." When 2017 arose, Cecilie Dawes, green entrepreneur and founder of Food Studio, had decided that she wanted to actually do it. She wanted to walk the talk. # Cecilie, what was it that you wanted to do? I had a wish of practicing what I had been preaching – to actually live sustainable to the fullest possible sense that I could, in my life. I am dedicated to communicate sustainable thoughts about food. On one hand we could say that this is simple – it is about what we eat, what we put into our bodies every day. But on the other hand it is very complex, because food often have a large ecological footprint. Thus this project became an attempt of simplifying the complexity into an every day practice that made sense for me. # Tell us, how did this manifest? Well, to begin with, my project Climatarian is not only about food, it’s a life-style project as a whole. Stig Larsæther, re-searcher at NTNU suggests that there are five main areas where we need to change our consumptions patterns in order to reach the goal of 1,5 degrees, as per the Paris Agreement. These are the areas of food, housing, transportation, holiday and clothing. His research is often referred to as utopic – my question is, is it really so? Or is it just that the way we live in today’s society is too far away and disconnected what is actually important to us as human beings? So firstly, I stopped flying and got rid of my car. My daily transportation now is walking or cycling, and for longer journeys, train or bus. Then I pondered whether I should live in a more primitive abode; a hjurt, a cottage or similar. But I ended up using what I got, to stay in my flat in town and rent it out on Airbnbn whenever I am not there. I have experimented with not using electricity and sleeping in a winter sleeping bag, which did not make so much sense because of central heating, but it was interesting to try. I began to shower only once a week, which works surprisingly well, especially in the summer when you can swim in the ocean. Clothes I have been washing only once a month, and same with starting the dish-washing machine. This has been no problem. Lately I have started to manifest the drawings of a micro house to be built. And for the last three months I have been practicing a farm life in the weekends. Holidays I have mostly spent sailing and at friends summerhouses in Norway. Summertime I have also spent a lot of time sleeping outdoor in tent. I have not bought any things, clothes or shoes, apart from a few things from Red-cross second hand shop. I got some lovely stuff from swopping nights with friends. The only thing that I had to buy where some woollen tights, they were not possible to mend and are necessary to endure a Norwegian winter. Then finally, food: I quit shopping in the normal grocery shops, and used Oslo Cooperative, trading directly with the farms, as the main source of vegetables in the low growing season. In the high season I harvested from the gardens that I had access to. A few things became the basis for my menu: I learned to cook my own salt, to make my own apple vinegar, I got a routine for fermenting vegetables and to make my own sourdough bread. I made an attempt to buy as much as I could directly from the farmer or to be self sustained. Local honey has been my sweetener and meat I have used mostly as a kind of spice. It’s a lot of examples of people who have been wanting to live a more simple life. For example I am very inspired by Walden and his “Life in the woods”. But the big difference between me and him, is that I want to be a part of the society. Because so much of what I do is about communication it did not make sense to go into the woods and isolate, to break that bond between my self and society. Basically you have to be in dialog in order to influence and inspire others. # New York Times suggests that a Climatarian diet includes eating locally produced food (to reduce energy spent in transportation), choosing pork and poultry instead of beef and lamb (to limit gas emissions), and using every part of ingredients (apple cores, cheese rinds, etc.) to limit food waste. Do you align yourself with this definition? I think it covers a lot of important aspects. Food waste is something that we all agree has to change, both within the industry and in the private households. We need to go back to the circular way of thinking, where for instance composting is a pivotal thing. The only thing I disagree with in the definition is how they focus on meat. During a week I eat maximum two meat meals a week, but making it the most important thing: what kind of meat and the history it has. This is where I think a large part of the solution lies within the global schemes of things. A rapport that came out a few years ago highlights the Agro-ecological way of farming as the most sustainable solution – this is what gives most yield on a global basis. Agro-ecological way of farming is about circular thinking. We have biodynamic farming as the most “extreme,” where everything is a closed circle within the farm. Agro-ecology is opening a bit more up, but builds on the same principle. And within this system the cow has a very important function, because it gives us organic fertilizer. And not only cows; chickens and horses as well. So to remove the animals completely from the system, this doesn’t make any sense to me. Within the definition mentioned above it says that we should rather eat chicken and poultry instead of cow, because of the gas emissions, but then you are not taking into consideration that within this whole circulation the composting system is binding the CO2 back into the soil again. This is an important factor that many tend to forget. I try to eat animals that had a long life on farms that are practicing this circle system. I also find it important that the meat has been refined by young societal change makers; people who want to create a difference within the food system. I believe there is a lot of power in making conscious choices about where we put our money. # If people feel inspired by reading this, how would you recommend them to take up a Climatarian menu? The most surprising has been how much fun it has been. A lot of exciting taste experiences! I am lucky to have great access to vegetables straight from the garden, and this has been very helpful since I don’t use normal grocery shops any more. But the point is that when I have reduced the possibilities of choices, I relate to the foods in a different way, the kitchen work becomes simpler and this actually enhances the flavours. I feel that my own capability of tasting has expanded, it is much more refined. And I can not eat salty, processed food anymore. That just tastes awful! Cecilies climatarian living - "what gives meaning for my local environment, with my resources - in my body"
Foraged locallly and seasonally in the woods: Wild garlic (made oil ice cubes to keep in the fridge), sour dock, nettles,blueberries, raspberries, lingon-berry, blue mussels, oysters and suger-seewead (dried for the winter),chantarelle and other mushrooms (also dried for the winter), plums and apples. 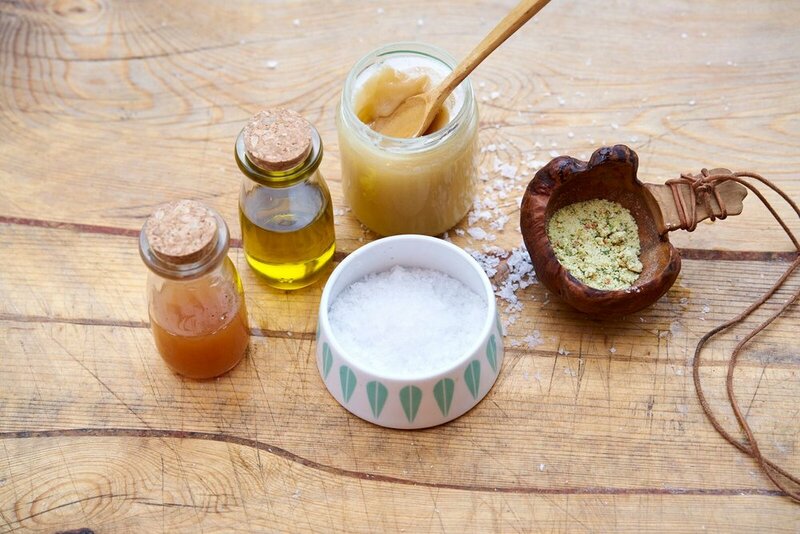 Basic kit: Bullion / bone broth,sea-salt, butter and rapeseed oil, honey, apple-vinegar. Photo: Alexander Benjaminsen. 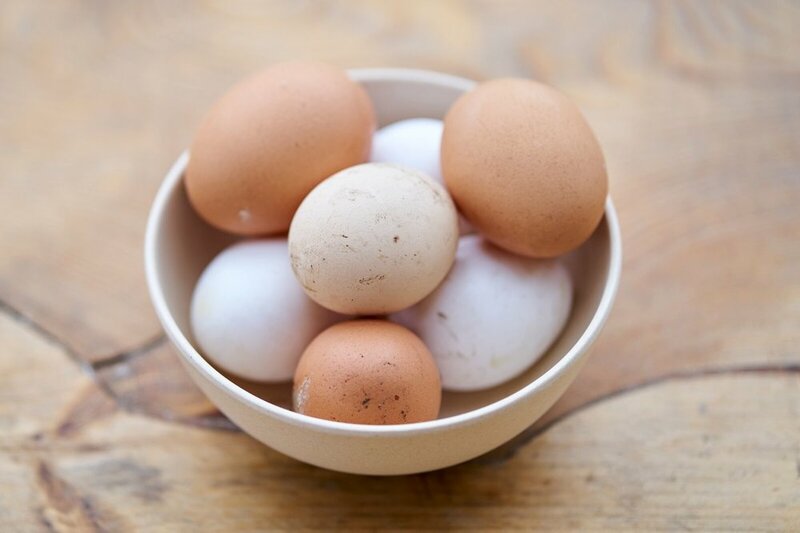 In our Nordic region this basis of ingredients is what has made the most sense for me over time, and what has surprised me is how well work in all seasons. I begin the day with warm water with apple vinegar in summer and chaga in winter to start the digestion and clean the system. Sourdough bread with butter and honey. Photo: Alexander Benjaminsen. Early spring-salad with eatable flowers (nasturtium), kimche and sunny boiled eggs. Photo: Alexander Benjaminsen. Nettle-soup sunny boiled eggs with sourdough-bread. Photo Alexander Benjaminsen. 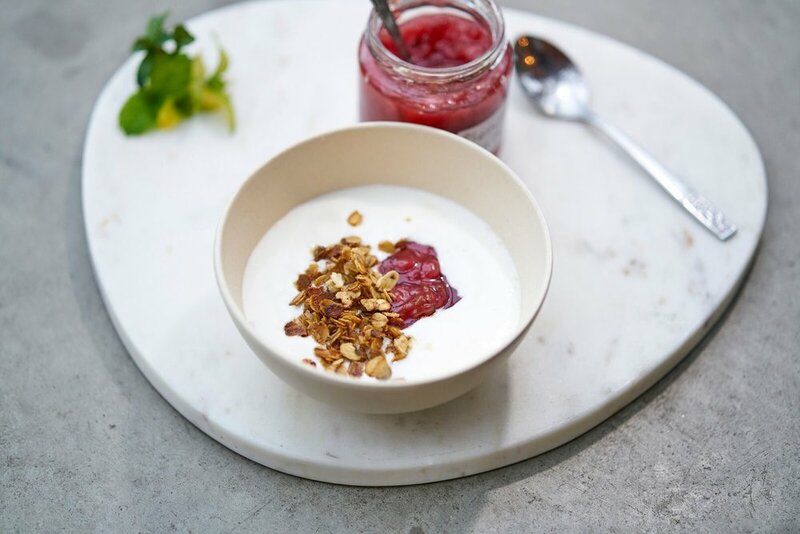 Milk kefir with oat granola and rhubarb and strawberry jam. Photo Alexander Benjaminsen. 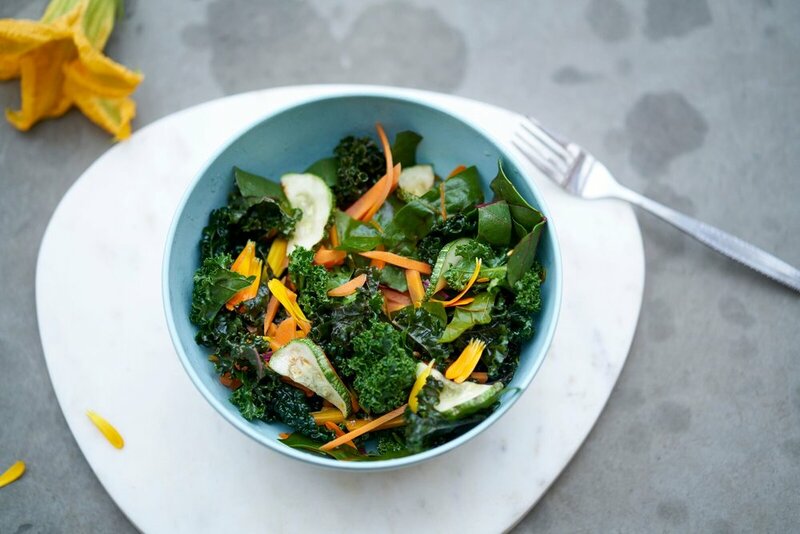 Summer-salad with fried spinach beet, flowers (calendula), zuccini and fermented carrots. Photo: Alexander Benjaminsen. 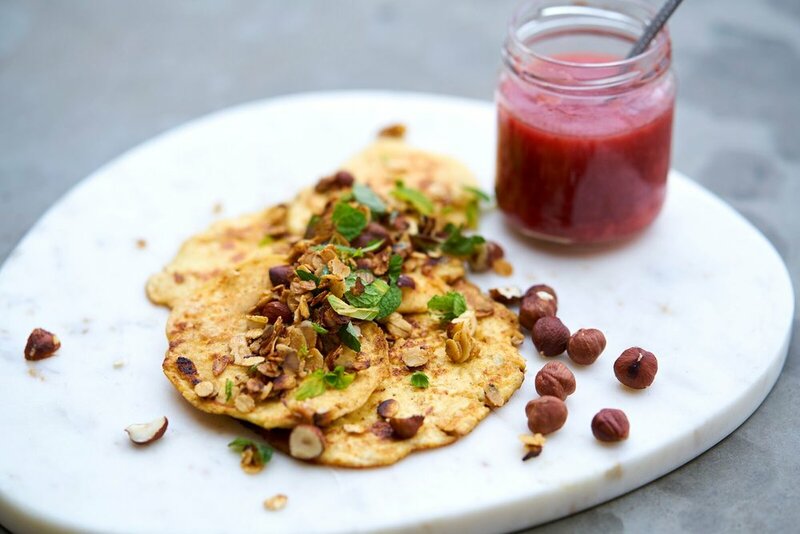 Sweet treat leftover pancakes of oat-porridge with kefir served with rhubarb jam and honey roasted oats and hazelnuts. Photo: Alexander Benjaminsen. 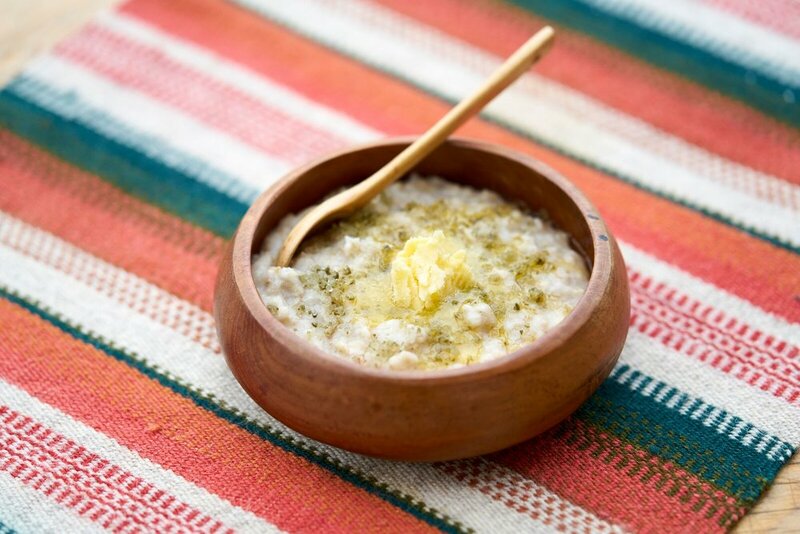 Savory oatmeal-porridge with herb-salt and butter. Photo: Alexander Benjaminsen. 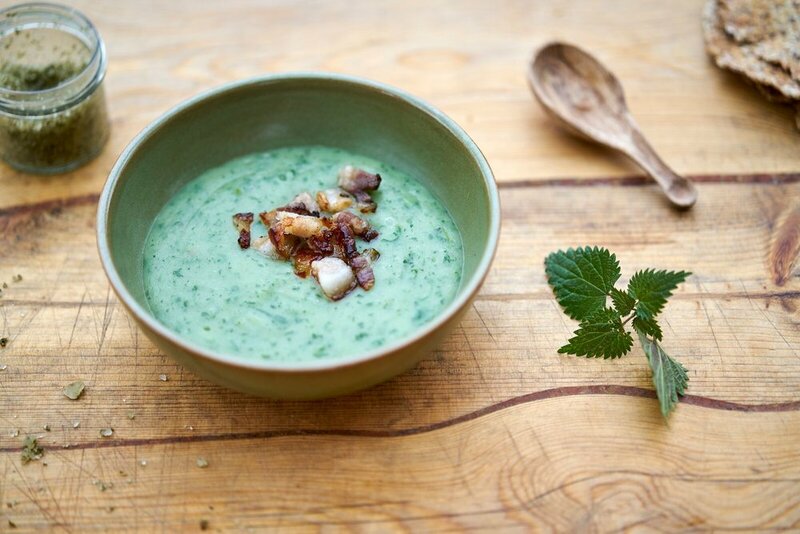 Pumpkin soup with wild garlic oil and bacon. Photo: Alexander Benjaminsen. 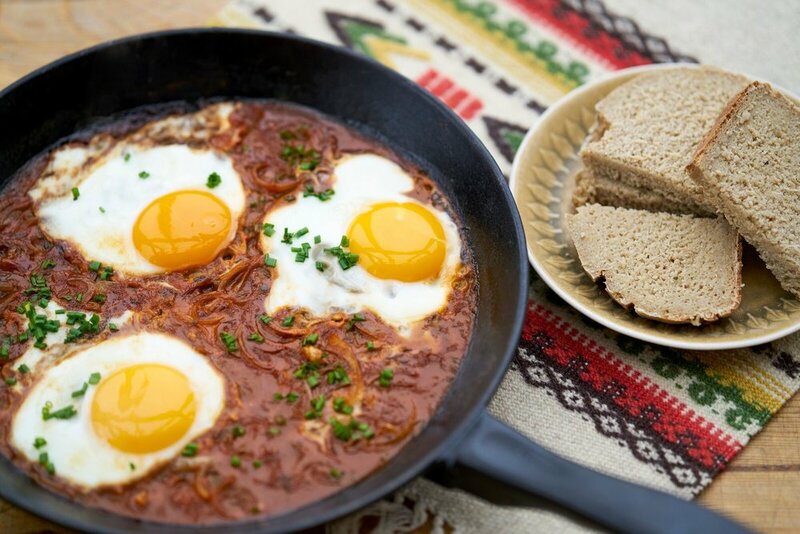 Marrocoan eggs norwgian style with fermented ketchup, onions, thyme, rosemary and sage. Photo: Alexander Benjaminsen. 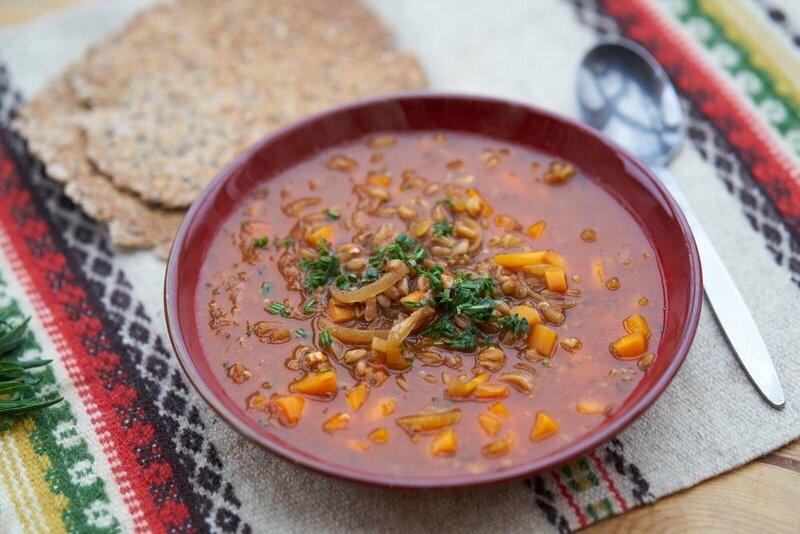 Bean-stew with spelt and fermented ketchup. Photo: Alexander Benjaminsen. Bygg-otto served with herbs from garden at Losæter and sausages from IOM. Photo: Alexander Benjaminsen. If you want the full receipes for Cecilies Climatarian Menue, tune in for Food Studios Magazine Hauste - in print fall 2018.